Hydro seeding is a grass planting process. The process begins by preparing a batch of material consisting of mulch, seed, fertilizer and water. 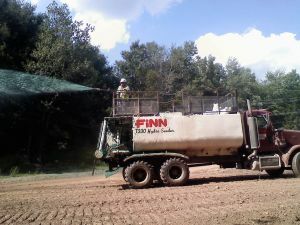 The batch of material is mixed in the tank of a Hydro seeding machine, and then pumped from the tank and sprayed onto the ground. After being sprayed onto the soil, the material appears as a green foam or soil coating. The mulch material enhances initial growth by providing a micro-environment beneficial to seed germination. The mulch holds the seed in place on the ground, helps hold moisture in the soil, and moderates the impact of raindrops.